Today in Masonic History Israel Brodie passes away in 1979. Israel Brodie is a British Rabbi. Brodie was born on May 10th 1895 Newcastle, England. He was educated in Balliol College, Oxford. Starting in 1923, Brodie served as the Rabbi of Melbourne Hebrew Congregation, Australia. He served in the position for fourteen years. During that time he was influential in establishing the Zionist Federation of Australia. Brodie was present at the Battle of Dunkirk during World War II and was one of the British soldiers evacuated. By the end of the war he was the Senior Jewish Chaplain, which is also referred to as the Forces Rabbi. Soon after the war, at the age of 53, Brodie became the Chief Rabbi of Great Britain and the Commonwealth. He also presided over the post-war expansion of the United Synagogue, a union of all British Synagogues. Brodie also founded the Conference of European Rabbis and led the organization. He also took a significant part in rebuilding the religious life of European Jews after the Holocaust. During his time as Chief Rabbi he toured the Commonwealth and strengthened the Jewish community in a quiet and significant way. In his closing years his work was overshadowed by religious dispute between Brodie and Rabbi Dr. Louis Jacobs. Rabbi Jacobs questioned the orthodox belief that the Bible had been written by the hand of God. Brodie prevented Rabbi Jacobs from becoming the principal of Jews College also known as the London School of Jewish Studies. Brodie passed away on February 13th, 1979. 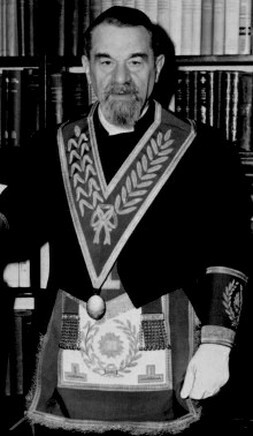 Brodie was a the Grand Chaplain of the United Grand Lodge of England.